Azotemia is a condition when the kidneys are unable to get rid of enough nitrogen wastes and they get build up in the blood. The kidneys are damaged due to some disease or an injury and so they are not able to filter the blood properly. Azotemia is defined as an increase in urea nitrogen and creatinine. It is a type of nephrotoxicity. Prerenal azotemia is the most common type of azotemia and can be reversed. This condition occurs when something that is affecting the blood circulation affects the kidney function and the fluid doesn’t flow enough through the kidneys. For example when there is low blood pressure to the kidney or due to irregular heart function, the kidney is unable to filter out the waste products or make urine. This leads to high levels of concentration of serum creatinine and urea. Other reasons that may cause reduced blood flow to the kidney are burns, dehydration, hemorrhage, long term vomiting or diarrhea, too much exposure to heat, shock or any blockage of the artery that supplies blood to the kidneys. Intrarenal azotemia is also known as acute renal failure or acute kidney injury. 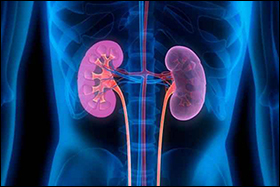 It is attributed to the problem with the kidney itself like infections, sepsis or disease of kidney. The most common type of intrinsic azotemia or intrinsic renal failure is acute tubular necrosis. In this case, there is excess nitrogen in the blood due to side effects of certain medications like antibiotics, anti-fungal drugs, chemotherapy, bigological therapies etc. It can be due to diabetes also. Postrenal azotemia happens due to obstruction of urinary tract leading to renal failure. It can occur along with prerenal azotemia. It happens when there is a blockage in the urinary system like stones, tumors, infections, urinary catheter, urinary crystals or enlarged prostate gland. Azotemia is common in people aged between 45 to 65 years. Long term diarrhea, vomiting, bleeding can also lead to azotemia. Azotemia is diagnosed by urine and blood tests. The tests are done to check the urea nitrogen and creatinine levels. The doctor takes complete medical history of the patient and record the medications, past infections and symptoms. He does physical exam too. At times, ultrasound and x rays may also be performed. A catheter may also be inserted into the urethra to investigate. Treatment of Azotemia focuses on correcting the cause of the imbalance before the kidneys become damaged. According to Ayurveda, kidneys are made from "Rakta" and "Meda" dhatus so these need to be treated in order to manage the symptoms of Azotemia. 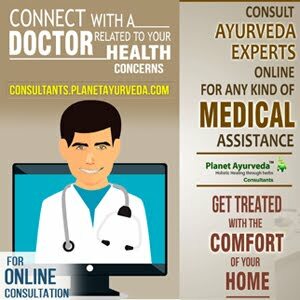 Ayurvedic medicines helps in chronic renal failure. The treatment helps in reducing the need for dialysis and reversing the kidney damage. This product helps in balancing the Pitta and Kapha energy of the body thus promoting healthy metabolism , healthy digestion and healthy blood circulation. The recommended dosage of Chandanadi vati is 2 tablets two times a day with lukewarm water. The product helps in balancing the Kapha and Vata energies of the body. These are classical Ayurvedic tablets used in treating any kinds of cysts, tumors, diabetes, obesity and general weakness. They help in managing the symptoms of Azotemia. The medicine has calming effect on the body. It is an effective blood purifier and helps in overcoming anemia. 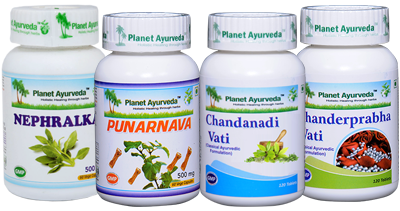 The recommended dosage of Chanderprabha Vati is 2 tablets two times a day with water after meals. The product is an excellent solution to all kinds of kidney problems. It neutralizes the ill effects of toxins in the kidney and removes extra fluids from the kidneys. The medicine helps in keeping blood pressure in control and helps to fight urine infections. The Nephralka capsules are formulated using herbs like Bhumi Amla, Mooli Satva, Revandchini, Kalmegh and Punarnava. All these combined together are helpful in treating kidney infections. The recommended dosage for Nephralka Capsules is 2 capsules two times a day with plain water. These capsules are made from the herb Punarnava which is known for its diuretic properties. The herb is a natural body cleanser as it helps to remove toxins from the kidney and helps in reviving the dying organs of the body. The medicine is useful in treating edema and water retention. It works great in managing kidney dysfunction, liver dysfunction and heart dysfunction. The recommended dosage for Punarnava Capsules is 2 capsules two times a day with plain water before meals. The patients are advised to increase vegetables and fiber in diet. Vegetables should be cooked properly with lot of water. They need to avoid excess of potassium and magnesium and even monitor the protein intake. Foods rich in potassium are bananas, potatoes, tomatoes, beans, chocolate, nuts, peaches, oranges, milk, raisin etc. They need to be limited in diet. Too much protein also makes kidneys work harder so the intake of protein should be balanced. Sodium should also be taken in limits as it caused high blood pressure and swelling. Carbohydrates intake should also be decreased to control the blood glucose levels. It is recommended to avoid junk foods, cheese, fruit juices and caffeine. Fluid intake has to be restricted as amount of urine is decreased in this problem. High cholesterol diet should be avoided as they may cause kidney damage and heart problems. Radish juice is very beneficial in this problem. Taking a spoon of basil / tulsi juice with honey everyday is suggested. Smoking should be completely avoided and drinking in moderation is advised.